Meixner Imaging has signed an agreement with Capturing Reality that entitles Meixner Imaging and its worldwide Distribution network as a new Distributor of Reality Capture, a state-of-the-art all-in-one photogrammetry software solution which automatically extracts beautiful and accurate 3D models from a set of ordinary images and / or laser scans. Philipp Meixner, CEO of Meixner Imaging, is looking forward to the partnership: "After the first meeting with the Capturing Reality team, we immediately knew that this is the right partner for us. Their specialization in 3D modelling by combining input data from images, laser scans and UAVs makes Capturing Reality an ideal partner in a growing 3D Modelling and Visualizations business. We are convinced that together we are building a strong partnership that will offer the best solutions for customers. ”Capturing Reality brings in a lot of expertise and experience in 3D Modelling that perfectly complement our own existing 3D Data Visualization and Data Management solutions. Exploiting such combined synergies strengthens both our product portfolios and at the end brings a lot of enhanced benefits and new business opportunities to our worldwide customers." 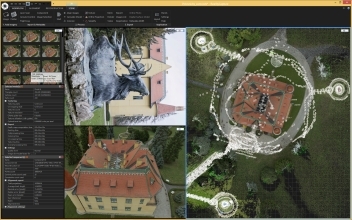 Capturing Reality, based in Slovakia, has created RealityCapture - a new photogrammetry software. It is faster than you expect and it can produce 3D models of unlimited size. Moreover, it is the only software which is able to mix lasers and photos easily without seams and limitations. It is a young company which officially started the public selling of RealityCapture licenses via the company’s webpage just in February this year. Meixner Imaging, based in Austria, is a world leader in 3D data visualization and data management and the official distributor of Euclideon’s unique data management and visualization solutions. Meixner Imaging is supported in its worldwide activities by numerous Partners and subsidiaries in more than 60 countries worldwide.